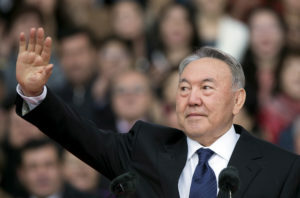 MOSCOW — Nursultan Nazarbayev, the only leader that independent Kazakhstan has ever known, abruptly announced his resignation Tuesday after three decades in power, raising uncertainty over the country’s future course. The 78-year-old said in a televised address to the oil-rich nation that he has taken the “difficult” decision to terminate his authority as president, effective on Wednesday. He did not give a specific reason, but noted that he would have marked 30 years on the job later this year. He said he sees his mission as ensuring the transit of power to a new generation of politicians. Nazarbayev added that he would retain the position of the chairman of the nation’s Security Council and the head of the ruling party. “I will serve you until the end of my days,” he said. He said that upper house speaker Kassym-Jomart Tokayev will serve as the interim head of state in line with the constitution until a new election is held. Kazakhstan, despite having a population of only 18 million, is the ninth largest country in the world with an area of about 2.7 million square kilometers (1 million square miles). It borders Russia to the north and China to the east and has extensive oil reserves that make it strategically and economically important. Nazarbayev came to lead Kazakhstan in 1989 as its Communist Party chief when it was part of the Soviet Union. and was first elected president weeks before the 1991 Soviet collapse. He has extended his tenure by landslide victories in successive elections and plebiscites. Nazarbayev has been widely hailed for maintaining stability and ethnic peace in Kazakhstan but has faced criticism for sidelining the opposition. Nazarbayev’s resignation will set the stage for a potential battle between Russia and the United States for influence over the successor government.